JUBA, South Sudan — George Athor, a former senior officer in the Sudan People’s Liberation Army, or SPLA, was killed Monday night in a two-hour firefight with the government forces in Marobo County in Central Equatoria state. Riek Machar, the vice president of South Sudan, said that Athor was in Central Equatoria on a recruitment drive among the Nuer population. The SPLA spokesperson elaborated with further menacing details, telling journalists that Athor was heading to Democratic Republic of Congo to meet with the leadership of the Lord’s Resistance Army, or LRA, a meeting allegedly sponsored by the Khartoum regime. Athor met Salva Kiir in Nairobi only a month ago in an attempt by the South Sudanese government to negotiate with the renegade general about the terms of his surrender. But the talks failed to convince Athor, and he expressed his dissatisfaction by warning of more violence to come, as long as the government is not prepared to meet his demands. George Athor turned against the South Sudan army after his unsuccessful election bid for the Jonglei state governorship in the April 2010 general elections. 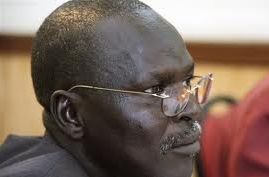 A source from Juba told the Enough Project that a primary point of contention in the government’s negotiations with Athor is over the Jonglei governor’s post, which Athor supposedly demanded as a concession from Salva Kiir. Jonglei state has been the scene of dramatic inter-communal violence between Lau-Nuer and Murle ethnic groups, tensions that George Athor’s group stoked by allegedly supporting these attacks. This year alone, inter-communal violence in Jonglei state claimed more than 1,000 lives. The South Sudan government has often stated that Khartoum supports George Athor’s rebel group in order to destabilize South Sudan. Geneva-based Small Arms Survey reported on “strong circumstantial evidence” that George Athor has received logistical support from Khartoum. Thwarting rebellions led by former officers of the SPLA across South Sudan is the biggest internal challenge for the world’s newest country. South Sudanese President Salva Kiir Mayardit has recognized the need for reconciliation. He has offered amnesty to rebel leaders and their soldiers and called on them to reintegrate in the SPLA—to limited effect. The death of George Athor highlights the urgency with which the South Sudan government with international support must address inter-communal divisions within the South. Another Athor will emerge tomorrow unless real progress is made in providing political and economic opportunities to communities that feel marginalized in the process of independence.